Whether you're a trueblood or a muggle, you have to hand it to J.K. Rowling: She's found the magical entertainment elixir that attracts both youngsters and adults. And older Harry Potter fans aren't just lining up at midnight movie screenings; they're also bringing their Potter mania to the workplace. From catching up on the latest news about their favorite fictional wizards on sites like MuggleNet and The Leaky Cauldron to engaging in discussions with co-workers about what the final book will bring, the Harry Potter frenzy has arrived. And offices across the country are going to have to deal with it. The fifth movie, Harry Potter and the Order of the Phoenix, opened on July 11, and the final novel, Harry Potter and the Deathly Hallows, hits bookstore shelves at midnight on July 21. Even if employees aren't busy chatting about everything Harry Potter during the workday, their productivity could suffer from all-night reading fests or midnight movie showings. In fact, even within our own walls at Entrepreneur Media, excitement over the final Harry Potter novel is brewing. Senior VP and editorial director, Rieva Lesonsky, is planning on taking the Monday after the book's release off to finish it, or to recover from a sleepless weekend of reading. For Lesonsky, work is the only place where people share a similar love for J.K. Rowling's creations. In her office, Sarah Foster, managing editor for an engineering society in Atlanta, says there are seven devoted fans. Foster and a co-worker took half a day off of work to get in line for the premiere of the fifth Harry Potter film. Other workplace rituals include going to lunch shortly after book releases for discussions. Foster says she's addicted to Potter sites like The Leaky Cauldron and also participates in a Harry Potter e-mail book club with another co-worker and two friends. When the novelty of the final book has worn off, Foster says, "We just might have to find a new book series to follow." Co-worker Rebecca Matyasovski wasn't able to take time off for the movie, but is using two vacation days following the book release for some serious reading. Matyasovski explains she'll be out of town the weekend the book comes out so plans on picking it up before her trip and spending the following Monday and Tuesday glued to Harry Potter's final adventures. As chair of the education department and director of the graduate teacher education program at Le Moyne College in Syracuse, New York, Cathy Leogrande has an excuse for her office Potter chit chat. This summer, she's teaching a graduate course "Harry Potter: Multidisciplinary Perspectives." She also recently started an adult Harry Potter discussion group and attends academic conferences dedicated to the wizard with her son. Leogrande has already pre-ordered three copies of the last book for her family and plans to attend a midnight party to revel with other devoted Potter followers. Since July 21 marks a pivotal moment in Harry Potter's history, the midnight bookstore release parties likely will be a bit more crowded than usual. 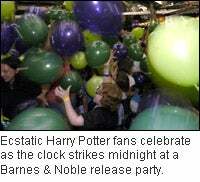 To prepare for the crowds, Barnes & Noble is hosting "Midnight Magic Costume Parties" at almost every one of its more than 800 stores the night of the big release. Will your employees or co-workers be there? Rather than fighting the wizard, as a business owner, you may want to embrace the frenzy. Scheduling a Harry Potter discussion group or luncheon the Monday after the book's release lets employees know they don't have to hide their love for the series and gives them the perfect outlet without disrupting work later in the day. To help avoid employees posting their thoughts on various Potter blogs while on the clock, you could create a spot on your intranet or company blog for post-book release chatter. A video software company in San Diego planned a generous solution to Harry mania. Drew Waters, an art director for the company, says the recreation committee planned a private screening of Harry Potter and the Order of the Phoenix the evening before the official movie release. The company rented out a movie theater for the viewing and allowed employees to bring a guest. Popcorn and soda were included. "It was crazy. About 275 people showed up," Waters says. "There was even a waiting list and phone chain for people who couldn't show up. Everybody loved it."